You know how they say good things come in small packages? Well, as I learned this week, good things also come in packages that fit oh-so-perfectly in your desk drawer. 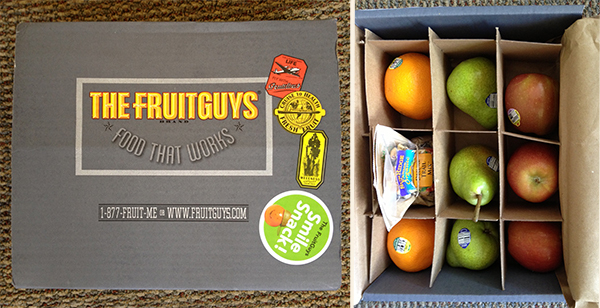 I give you: The SmileSnack box from the FruitGuys. The new service is meant as a makeover for your workplace snacking. After all, reaching for something healthy when you hit the 2 p.m. slump is especially important if you’re watching your waistline, since unhealthy snacks are a major contributor to overeating. With SmileSnacks, the FruitGuys send subscribers a box of healthy snacks each week, saving you a trip to the vending machine. Bonus: It makes reaching for something healthy kind of a no-brainer. The boxes include eight servings of fresh fruit plus three servings of granola or trail mix. My box (above) was packed with oranges, apples and pears (holy moly those pears were delish! ), but kiwi is sometimes included as well. You can decide if you want all organic fruit or not. The boxes also come with a nutrition chart which outlines proper portions for each snack and when you should eat them. Conventional (i.e., non-organic) boxes cost $17.75 each; organic boxes are $19.75. You can choose your start date and delivery day for each week, as well as delivery frequency. (If you just want to try it once, there is an option for one-time delivery.) Check it out here.